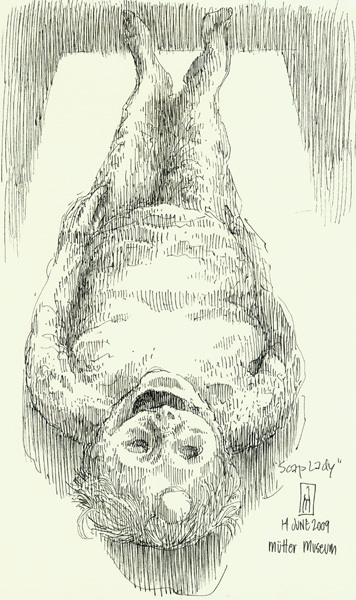 The Mütter's Museum's prize specimen may very well be the mummified remains of the Soap Lady. Why this strange name for a corpse? The good lady presents an example of a very rare event in bodily putrefaction — a process called ‘saponification’, in which bacteria, humidity, and chemistry conspire to turn fat into a substance called adipocere or ‘grave wax’. The compound is rather like soap, so if one was so inclined one could work up a decent later from a hunk of Soap Lady. But modern curatorial practices being what they are, you'll need to find another brand for washing up.